The magic that has made Walt Disney Animation Studios world-famous comes back in full force with the Chris Buck and Jennifer Lee co-directed animated film Frozen. The story is filled with family-friendly humor and tackles the meaning of true love in a way that invokes all of the nostalgia that Disney is known for. Frozen will inevitably become one of the Disney animated classics that will resonate with all audience members, regardless of age, race or gender. The film tells the tale of sisters Elsa (Idina Menzel) and Anna (Kristen Bell), the two young princesses of the kingdom of Arendelle. Elsa, the elder sister, was born with magic ice-conjuring powers, but when she accidentally hurts Anna, she must keep her powers secret from the world. She shelters herself in her room, and as they grow older, the sisters grow apart. 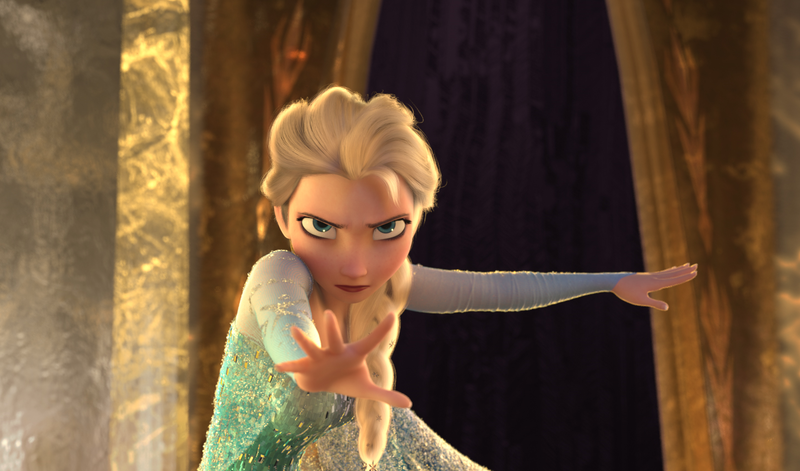 On the day of Elsa’s coronation, Anna causes Elsa to lose her temper and show her powers to the world. Elsa then runs away, and Anna chases her in order to end the snowstorm that Elsa caused. She is helped by mountain man Kristoff (Jonathan Groff), his reindeer Sven and the magical snowman Olaf (Josh Gad). The film comes to question what true love really is and examines the bonds of sisterly love. The film is loosely based on the Hans Christian Andersen fairy tale, The Snow Queen. While the original tells the story of a boy who gets kidnapped by a snow queen and a girl who goes to rescue him, Frozen takes a far different approach. This change in the plot is meant to enforce one of the major themes of the film. The directors wanted to question what true love is, a theme that was addressed in the original fairy tale but not as emphasized as it is in the film. The original story was a little too dark for a children’s movie, and the changes seek to make the characters more relatable to the audience. The movie does a great job of exploring that theme, especially with all of the complicated twists that come with the two girls being sisters. The film takes that family dynamic and just explores how important love is no matter what comes between them. It is a strong message that truly resonates among Disney’s target audience, which is the family demographic. Despite Disney’s reputation for being mainly targeted for children, this movie is actually incredibly funny. While the humor is, of course, family-friendly, the characters each have their quirks that make the film very relatable. Anna, the protagonist, comes off as an ordinary awkward teenage girl, in large part thanks to Kristen Bell. Known for her work in comedies such as Forgetting Sarah Marshall, she does a wonderful job of bringing her own humor into the animated character. It gives the character a dimension of realism that makes the story relatable to the average moviegoer. The animation was spectacular. The animators created a world that seemed so expansive and otherworldly, one that could be expected from the likes of Star Wars or Lord of the Rings. Everything about the film was filled with so much detail, yet it did not feel excessive. They found the right balance to make it engaging, but not ridiculous. The way that the snow and ice move makes the film so much more fulfilling in a way that hand animation could not have achieved. The expressions of the characters seemed so realistic, the magical powers felt truly enchanting and the landscapes were beautiful. This film is a testament to how far animation has come and what it can be capable of. When Elsa uses her ice powers, it looks magical, but in a realistic way. Had the effects not been done correctly, the film would have lost a lot of its charm. Musically, the film has also hit a high note. This film is reminiscent of the great Disney musicals such as Pocahontas, which Chris Buck also worked on. The musical pieces were well integrated into the plot, and the pacing with the story was perfect. Broadway will inevitably adapt this film for the stage, as it has done already with Disney greats such as The Lion King. The singers also all had wonderful performances, no doubt due to the fact that most of them come from Broadway. The musicality of the film comes together in a completely cohesive way. Disney has come out with another hit to follow last year’s Wreck-It Ralph. Frozen is funny, nostalgiac, deep, beautiful and riveting. It may have taken Disney a long time to adapt The Snow Queen, but they managed to get away with an instant classic that brings people back to the Disney of old.